In a 12-inch skillet, pre-heat 3 tablespoons oil over medium-high heat. Cook chopped onions until lightly browned, stirring occasionally. Add more oil if needed. Remove onions to large bowl. Grease (3 1/2-inch) muffin pans with oil or cooking spray. Remove sausages from casing. Over medium-high heat, cook sausage, stirring to break up large pieces. Cook until sausage is browned and golden, stirring occasionally. Remove to bowl. When sausage has cooled slightly, add 2 lightly beaten eggs, one-third of cooked onions and 2 teaspoons minced garlic; stir to mix well. Preheat oven to 425. Shred potatoes in food processor. Place shredded potatoes in a colander; rinse under cold running water. In large bowl combine shredded potatoes; 1 bag Manischewitz Soup Mix, 1 1/2 bags Matzo Ball Mix, remaining sautéed onions, remaining garlic, 5 lightly beaten eggs, salt and freshly ground black pepper. 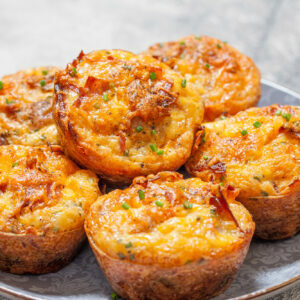 Spoon 2 tablespoons of potato mixture into each muffin tin. Top with a tablespoon of sausage mixture and 2 tablespoons potato mixture. Drizzle a few drops of olive oil on top of each muffin. Bake for about 20 minutes, until golden brown. Remove from oven. Carefully loosen each kugel with a paring knife or small spatula to release it; turn muffin pan onto large flat plate to remove kugels. Serve kugels with Manischewitz Creamy Horseradish Sauce with Dill.